Key Knife’s newest retrofit chipping systems for drum chippers utilize the latest in indexable knife technology. If you are looking for a dependable and economical chipper system to improve chip quality and increase production, then Key Knife’s retrofit drum chipper systems are the solution. Key Knife’s drum chipper retrofit systems increase production through a longer lasting knife-edge, and a tough durable design. The new Uni-Ridge Knife has proven to last twice as long as other brands of indexable and conventional knife systems. Chipping operations benefit from less downtime and more production. Key Knife’s innovative Uni-Ridge Knife utilizes an optimal tip to breaker distance to consistently formulate a uniform chip. A large ridge located on the bottom of the knife provides a smooth transition from the knife across the counterknife, greatly reducing the break-up of quality chips into pins and fines. Key Knife’s indexable Uni-Ridge Knife eliminates the need to grind knives, and the associated labor, maintenance, and part costs. 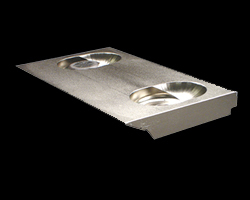 In addition, a few retrofit configurations utilize an innovative two-sided counterknife, which cuts counterknife costs in half. To further reduce operating costs the Uni-Ridge Knife can be rehoned and reused using Key Knife’s compact Pro-Honer II. The small indexable Uni-Ridge Knife reduces the risk of injury caused by handling heavy conventional knives. In addition, the disposable Uni-Ridge Knife eliminates the hazardous task of babbitting knives. (Holder configurations only)- The innovative counterknife is double-sided for twice the part life. A bottom key locates the counterknife in the holder, ensuring the knife tip is accurately positioned for a consistent cut. 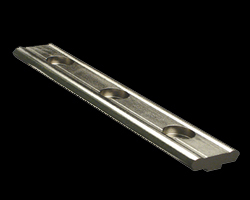 The holder is CNC machined from either A514 or 4340 steel (depending on retrofit configuration). A diamond carbide powder is weld-fused to the contact surface ensuring the longevity of the holder in even the most aggressive applications. The clamp is precision ground and CNC machined from 4340 steel. The clamp locates on the holder and on the Uni-Ridge Knife’s top key to produce Bridge Clamping forces. 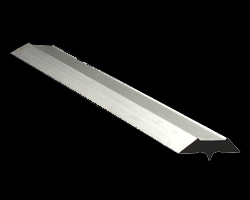 Bridge Clamping increases knife stability and reduces knife flutter. This configuration uses a simple cassette-style assembly that mounts between the drum and OEM clamp. The Key Knife clamp and counterknife are linked together for accurate clamping. Shim packs are used to adjust knife tip location. No modification to the drum is necessary. This configuration uses a holder to mount Key Knife clamps and counterknives between the drum and OEM clamp. This unique design allows for the use of an indexable counterknife. Shim packs are used to adjust knife tip location. No modification to the drum is necessary. This configuration is for drum chippers that have shallow pockets, preventing the use of Key Knife’s cassette and standard holder configurations. This configuration replaces the OEM clamp with a holder used to mount Key Knife clamps and indexable counterknives. Shim packs are used to adjust knife tip location. No modification to the drum is necessary.